Alternate Names: "Harry Potter And The Order Of The Phoenix DS", "Harry Potter 5", "Harry Potter 5 DS"
Explore all of Hogwarts to recruit Dumbledore's Army, overthrow Umbridge and prepare to fight Voldemort and his Death Eaters. Use the DS Stylus to cast spells and unleash powerful fifth-year magic. ...from the Dementor attack in Little Whinging to the epic battle at the Ministry of Magic. Fly Thestrals, play Quidditch and accompany the Order of the Phoenix to Grimmauld Place. 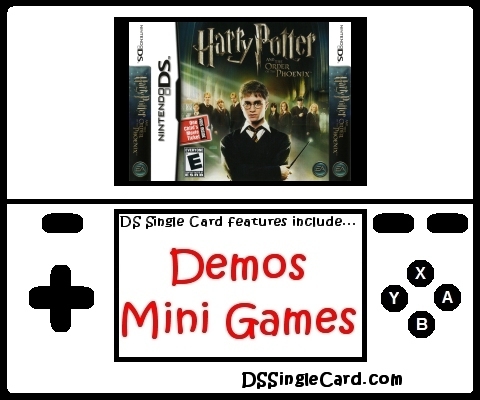 Compete against the best players from each house or go head-to-head with a friend in single and multiplayer Wizard Games including Exploding Snap, Gobstones and Chocolate Frogs. Use the DS Microphone to fan the flames under your Potions cauldron!